Like water or gas leaks, energy leaks are also costly and waste natural resources. 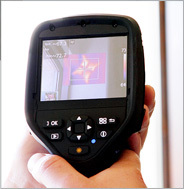 Pinpoint Leak Detection has the training, expertise and state-of-the-art equipment to perform a thermal imaging scan of your entire home or building to locate areas that have water infiltration or air leakage. In addition, we will provide a full color detailed report detailing the locations that may need repair to eliminate future damage and thereby saving money and natural resources.